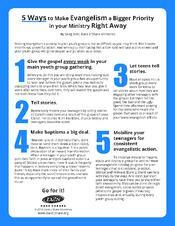 Evangelism is high on every youth leader's list, it is just hard to do sometimes. This free quick guide PDF highlights 5 ways to take the priority of evangelism and program it into your ministry. And, they are all things you can start doing right now. No planning, buying, or training involved!